The Chien Français Blanc et Noir is a large scenthound that was developed in France. They hunt in packs for large game, specializing in deer, and are rarely seen outside their homeland. 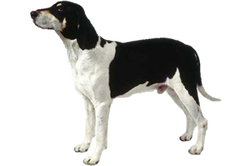 The Chien Français Blanc et Noir is one of three Chien Français, the other two being the Blanc et Orange and the Tricolor. Although classified as separate breeds they vary little besides coat color. In 1957 a committee of canine experts was put together to revise the groupings and standards of French Hounds. They divided them into two major groups, the Anglo-French and the French – those that had English blood and those that did not. The Chien Français Blanc et Noir is the oldest of the three Chien Français and is descended mostly from Grand Gascon-Saintongeois and Levesque. Is the Chien Français Blanc et Noir Right for You?